1. Start with your master store. From Your Apps, select Replay. 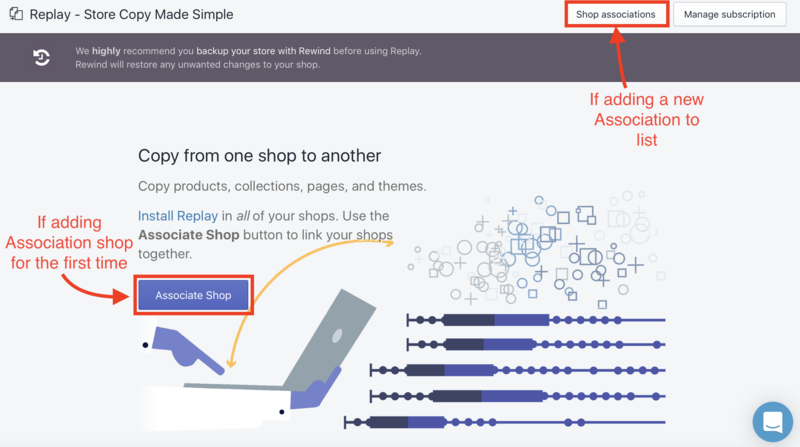 From the Replay Home Page, select "Associate Shop". You can also select "Shop Associations" - both will direct you to the same page. *Note: Once your first shop association has been made, you will use the "Shop Associations" button in the upper right-hand corner from then on to add any other stores you wish to associate. 2. 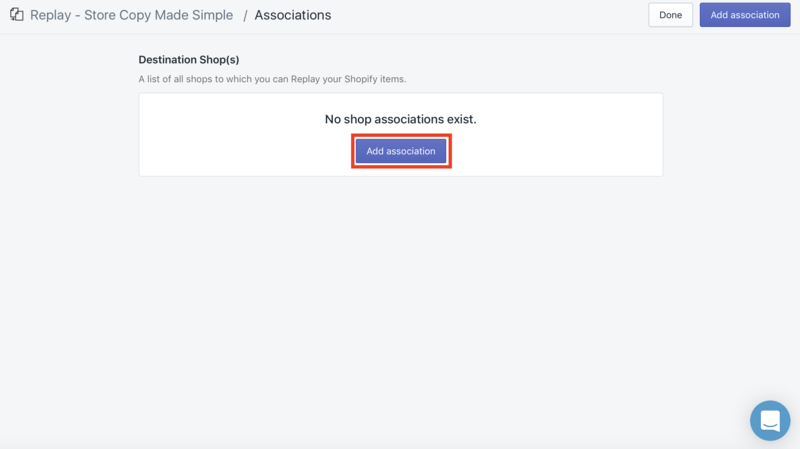 From the Associations page, under "Destination Shop(s)", select "Add Association". 3. You will be given an "Association Key". Highlight and copy this key code. 4. Now go to your destination store (the store being copied to). Enter the Associations page and go to "Add Association" - as explained in Steps 1 and 2. Once there, go to the empty text box located below that store's Association Key. It will be located next to "Associate Shop". *Note: You will notice that your destination store also produces its own Association Key. This is not needed when setting this store up as a destination store. This is in the event that you ever wish to change it to a master store - instead of a destination store - and use it as the store being copied "from", to other stores. 5. In the empty text box, paste the Association Key that you copied from your master store in step 3. 6. Click "Associate Shop" in the bottom left-hand corner. 7. In this destination shop, you will now see that the master store has been added to your Associations. *Note: Regardless of which store you're in - master or destination - your Associations page will always list your Associations as the store's "Destination Shop(s)". It will be up to you which store is the store being copied "from", and which is being copied "to". 8. Back in your master store, click "Cancel" to leave the page where you copied the store's Association Key. The Associations page will automatically refresh and update to reflect your destination store, now associated to this shop in turn. If you wish to add any more associations to your master store, simply repeat the above steps with the new destination shop(s).